One of the biggest problems modern parents face is getting their kids up off the couch, away from the TV and electronic devices, and out into the garden to play. It seems like if our children aren’t watching TV they’re on some electronic device playing a virtual game. Many of them can go days or even weeks without having their bare feet touch the grass. Of course, this behavior contributes to our country’s obesity epidemic. The Centers for Disease Control and Prevention (CDC) estimates that at least 17 percent of kids between the ages of 2 and 19 are clinically obese. And that isn’t all parents have to worry about. While they’re playing those games, children are also being fed subliminal messages which can contribute even more to them being unhealthy and making poor nutritional choices. A recent example of this was when Gatorade agreed to cough up $300,000 and to stop making “disparaging remarks about water,” after being taken to court by California Attorney General Xavier Becerra. The sports drink giant released a game called Bolt! which was available in 2012, 2013 and then again for a brief time in 2017, in which players would give Olympic runner Usain Bolt Gatorade to increase his fuel levels. If, on the other hand, the player gave the runner water, his fuel level would decrease, leaving him with reduced power to perform. To direct a message like this at children with a limited understanding of healthy nutritional choices was unconscionable. Gatorade was quick to deal with the matter – it was settled out of court in only one day – but there was no admission of guilt forthcoming. The mobile game, Bolt!, was designed to highlight the unique role and benefits of sports drinks in supporting athletic performance. We recognize the role water plays in overall health and wellness, and offer our consumers great options. The company has also agreed not to produce any other games like Bolt! that might lead kids to believe that water would interfere with athletic performance while sports drinks would enhance it. Bolt! is no longer available to play. 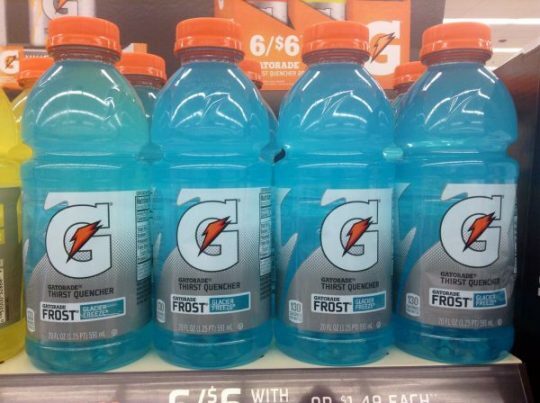 Gatorade has also half-heartedly agreed to make “reasonable efforts” to abide by parent company PepsiCo’s rules regarding responsible advertising for children. Let’s face it: Just getting our kids involved in “routine physical activity” is enough of a challenge. How many of us can claim that our children partake in such vigorous activity that they need a sports drink rather than water? And, even if they are taking part in really vigorous activity – in which case, well done! – there are better options than sugar-laden, nutritionally vacant sports drinks. So, for all those families out there doing their best to be healthy and active, water is always your best option for hydration – no matter what messages advertisers are trying to drill into your kids’ heads. And if you want to boost performance a little more, try iced rooibos – it’s delicious with a touch of stevia!